All-NBA Spurs guard Demar DeRozan scored season-high 36 points after missing nine of his first 12 shots in win over Blazers. Spurs' injury/inactive report: Guard Evan Turner (left Achilles tendon inflammation), questionable. Spurs' injury/inactive report: Guard Marco Belinelli (neck stiffness), questionable; Drew Eubanks (G League assignment), out; center Pau Gasol (left foot soreness), out; forward Ben Moore (G League assignment), out; guard Dejounte Murray (torn right anterior cruciate ligament), out; guard Lonnie Walker IV (G League assignment), out. Jazz's injury/inactive report: Center Tony Bradley (G League assignment), out. Notable: The Spurs complete a back-to-back Wednesday night when they play the Lakers in Los Angeles. . . . The Silver and Black haven't won back-to-back games since winning four in a row in an eight-day span (Oct. 27-Nov. 3). They are 5-10 since then . . . The Spurs recorded only the ninth 60/70/90 game in NBA history, and the first since 1995, in their win over the Blazers on Sunday. The Silver and Black made more than 60 percent of their field-goal attempts, more than 70 percent from three-point range and more than 90 percent from the free-throw line. They set a league record for most three-pointers made in a 60/70/90 game with 11. The Spurs are the only NBA team with an all-time winning record against every team in the league. SAN ANTONIO – When his shot isn’t falling, All-NBA Spurs guard DeMar DeRozan does what all outstanding scorers have done since Dr. Naismith hung the first peach basket. DeRozan demonstrated that in his stellar game against the Portland Trail Blazers on Sunday, overcoming a cold start to score a season-high 36 points and help the Silver and Black roll to a 131-118 victory at the AT&T Center. DeRozan missed nine of his first 12 shots before going off in the third quarter, when he scored 18 of the Spurs’ last 20 points of the period. He scored 15 consecutive points during that run. DeRozan finished the game 13 of 27 from the field, and made 10 of his last 15 attempts. DeRozan played the entire third quarter and eight minutes of the fourth before he went to the bench. The Spurs (11-12) avoided their second three-game skid of the season with the win over the Blazers. They were coming off losses of 39 points at Minnesota on Wednesday and 31 points at home against Houston on Friday. San Antonio gets back to it Tuesday against the Utah Jazz with the front end of a back-to-back on the road. The Silver and Black play the Lakers on Wednesday in Los Angeles, and play the Lakers again Friday night at the AT&T Center. The Friday matchup with the Lakers will start a six-game home stand for the Spurs. Tuesday night’s game against the Jazz will give the Silver and Black another opportunity to win back-to-back games for the first time since they won four straight in an eight-day span (Oct. 27-Nov. 3). They are 5-10 since then. 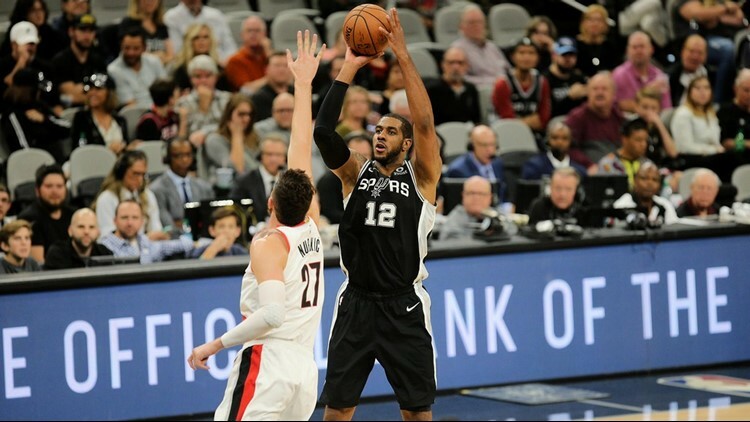 While their much-maligned defense was still lacking in the win over Portland, the Spurs made just enough stops to keep the Blazers playing from behind at crunch time. The Silver and Black were outstanding on the offensive end of the court, shooting 60.2 percent (50-83) from the field, 73.3 percent (11-15) from the three-point line and 90.9 percent (20-22) from the free-throw line. The 60/70/90 game was just the ninth in NBA history and the first since 1995. San Antonio set a league record for most three-pointers made in a 60/70/90 game with 11. “It’s the same offense we used in the last two games,” Popovich said, when he was asked what the Spurs had done differently on offense to be so successful against the Blazers. “It was a fine win. Portland is a fine team – really well coached, talented, and they’ve been doing great. The Blazers shot 52.3 percent (45-86) and nailed 12 of 29 three-pointers. They had 25 assists on their 45 made field goals. “There are all kinds of ways to evaluate the defense,” Popovich said. “There’s post play. There’s lots of switching, and people have to talk and not get back-doored. You have to guard one on one.